Mounts on edge of pilaster. Chrome plated zamak. For 1 1/4" thick round edge pilaster. Typically used on metal partitions with square concealed latch slide pin. For inswing or outswing doors. Replacement for Hadrian. Chrome plated door pulls for Hadrian partitions with 5-7/8 inches between screws. Mount back to back through 1" thick doors. 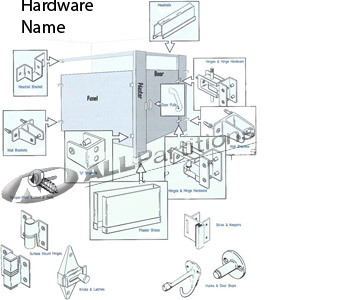 Click image for stirrup and continuous brackets and panel-support brackets. Replace broken concealed latches or holes in doors with a new latch, cover plate, keeper, and bumper. • Inswing includes cover plate, latch, keeper, and stop. • Outswing includes same parts plus a door pull. Matte Finish. For Outswing doors. Matte Finish. For inswing doors. 3-1/2" between center to center of holes.